After holding a Town Hall Meeting on Prescription Abuse, the Drug Free Task Force decided to look into ways to get medications out of the hands of those who might misuse them and ways to keep medication from being disposed of ways that were harmful to the environment. The group educated themselves on the negative impact medications have on our water system when they are flushed and learned about the process to hold a medication collection. This group organized the first safe medication collection for all residents in Madison County in 2009. These events are now held bi-annually, and three additional kiosks were installed at different sites for daily collections. As of April 25, 2015, more than 6,000 pounds of medication, both prescription and over the counter, has been collected keeping these medication out of the hands of those who might misuse them and out of our water system. According to a student survey, the percentages of monthly misuse of prescription drugs by junior and high school students in Madison County was at a rate 2x or greater than the national findings. Additionally, for the 12th graders, the local findings were a startling 3x greater than the national monthly use percentages. In addition, a survey conducted with the 15 pharmacies in Madison County confirmed that prescription misuse, specifically painkillers, was a problem. In response to this growing concern both nationally and locally about prescription drug use and abuse, the Drug Free Task Force, in collaboration with a local high school, held a well-attended Town Hall Meeting on prescription drugs. A panel of experts including law enforcement, the District Attorney, and a counselor, spoke to the audience. The consensus was that something needed to be done to limit accessibility of prescription drugs. A small group agreed to look into holding medication take back events that would go beyond the scope of events being held sporadically by local pharmacies. Volunteers were identified, and they started to meet to explore the process for a medication take back event. The objective was to reduce the accessibility of unwanted or expired medication. These medications were being stored in homes making them easily accessible to family, friends or even visitors as in the case of a Realtor’s Open House. Many in the group knew of individuals who had painkillers in their homes that they did not need but did not know how to properly dispose of. In addition, the means that some were using for disposal, flushing the pills down the toilet, was harmful to our water system. The group arranged an educational presentation by a college instructor on water treatment who described in detail the harm to the environment of improper disposal. So, to reduce accessibility and protect the environment, the group decided to begin the process and paperwork for a take back event. One person took the lead and worked with the Health Department, the DEA, and the local landfill to complete the extensive paperwork necessary to hold such an event. 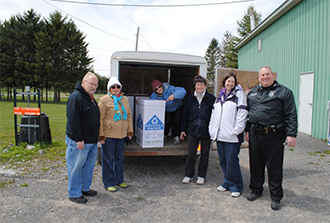 The Sheriff’s Office was engaged as they were required to be present during the collection and to transport the collected and boxed medication to the incinerator several counties away. Volunteers were recruited from the local Retired Senior Volunteer Program and other agencies. 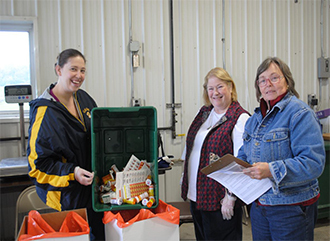 These volunteers directed traffic at the landfill, and collected, opened and contained the medication for disposal, among other tasks. All agreed to distribute promotional flyers, handbills and posters. Articles were written for the newspapers and advertisements were purchased. Two members appeared on the local radio show to discuss the event and encourage participation. Once funding for some of these activities ended, the involved parties agreed that each would take a piece of the work and make it happen because they believed in the effort. At the collection site individuals were polled about which township they came from and how many households had contributed to the medication being dropped off. We were able to collect from all townships in this very rural, spread out county. We also heard that some were unable to come to the landfill as they had no transportation, they were homebound, or other issues. As a response, two other collection events in the other end of the county were set up. In addition, the group worked to purchase and install three permanent kiosks for daily drop offs. The bi-annual event was successful but there was a need for collections on a more regular basis. Medication that is collected at the landfill and in the kiosks is being weighed. To date, since 2009, these collection events and kiosks have collected 6,000 pounds of medication. This is significant for a county of only 71,000 residents. People have become more aware of the importance of safe medication disposal as a result of the promotion and education surrounding these events and the kiosks. Individuals from the community call for information on the next collection event and for directions and information about the kiosks. For a county of only 71,000 people, to have taken 6,000 pounds of medication out of circulation for safe disposal is significant. The group has consulted with others about how to work with the state Department of Health and the DEA to hold an event. The relationship between the partners, which include law enforcement, the landfill, the health department, county government and the prevention council have been strengthened. Other projects have been established as a result of this successful partnership. Even when funding ended for the original initiative, the group met to brainstorm how to continue and which partner would be responsible for which task.